The butterfly is a sentient creature. Like us, it has senses of touch, taste, smell, hearing and sight. However, butterfly senses don't work in quite the same way as mammal senses. Butterflies don't have noses or ears, but they do have six feet that do quite a lot of sensory work for them. Butterfly hearing is not well understood by scientists, according to Dr. Jayne E. Yack at Carleton University. However, she suggests that many diurnal butterfly species of the genera Nymphalidae and Morpho, who fly during the day, have developed a form of ear, which is more complex and sensitive than a moth's ears. Both moths and butterflies primarily use their ears to escape predator bats. Yack's discoveries suggest that in addition to listening out for bats, daytime flying is an evolutionary adaptation that keeps butterflies safe from the nocturnal bat. Another genera of butterfly -- the hedylids -- are nocturnal butterflies and ancestors of the diurnal species, Yack believes. These butterflies have some form of very sensitive hearing device on their wings that picks up ultrasound. 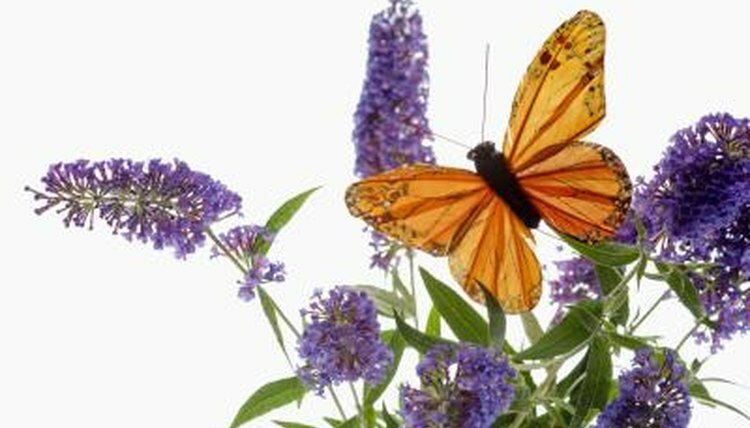 A butterfly uses its feet and antennae to smell the flowers. Insects generally have a sharp sense of smell, which protects them from toxic plants. The butterfly's knob-shaped sensors on the end of its antennae pick up smells that lead it to a flower with nectar. When it lands on a flower, its feet detect the the smell of the substances in the plant and decide if they're suitable food, or not. Feet, antennae and minuscule hairs all over its body provide the butterfly with the means to feel an object. The antennae on its head do a lot of multitasking and can sense scent, wind direction and food. A butterfly is attracted to a brightly-colored flower through both color and smell, but it senses the smell of the nectar before it sees the flower. The antennae also help the butterfly navigate around flowers by feel. The proboscis, which is a type of nose, is used to collect nectar. This part of the butterfly detects taste through feeling the nectar, something humans can't do. Like most insects, the butterfly has a compound eye. This means it has more than lots of tiny lenses called ommatidia, which allows it to see in various directions at the same time. It also makes it very sensitive to color and movement. The butterfly eye can also detect ultraviolet light radiating from a flower. The eyes can also spot color patterns on flowers that indicate where the nectar is in the flower.